Lady Lovely Locks and the Pixietails was a character property created by American Greetings Corporation (creators of Strawberry Shortcake, Care Bears, and Popples among others) in the mid-1980s. The characters were licensed for a toyline by Mattel, and for a syndicated animated television series by DiC in 1987. However, only 20 episodes were produced in all. 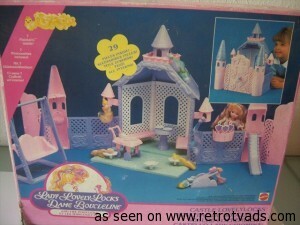 The Lady Lovely Locks toyline was created by Mattel and produced from 1987 to 1989. The toyline consists of character dolls that are approximately 8.5 inches tall, with certain dolls having long, colorful locks. Most dolls came with three to four Pixietails (small plastic animals with long silky tails). The Pixietails could be worn in the hair of either Lady Lovely Locks or the child. Additional items in the toyline were other pets and setting playsets.